Suitable for all passenger cars, Cart parking is a multilevelled car parking system that is designed to park 20 to 200 cars into each parking spaced by moving vehicles automatically in all the three axes by using a lift and a parking cart. The parking cart can move independently on each parking level and retrieve vehicles from parking lots. This is one of the most advanced mechanical parking systems with speedy car parking or retrieval that is suitable for a larger scale of car parking. It can maximize the utilization of the underground space by installing many rows of the carts in the underground. 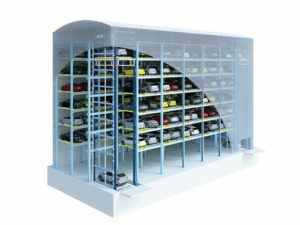 The car usually enters the building/parking space through the entrance room and is then raised up to required parking level using lift and then moved to parking space using a cart. This is a hassle-free solution for parking space without driving through the drive ways and finding the parking space. Also, as no human may enter this parking lot, it is much safer. This system can also be incorporated with rotary mechanism at the bottom to rotate the car 180 degrees to drive the car directly forward.